We request riders/commuters to read below guidelines carefully and follow them to have safe, secure and comfortable social journey. Vehicle owner (or driver) must drive safely and follow traffic rules at all times. Vehicle owner (or driver) may ask and confirm the identity of ride members before letting them inside the vehicle. Riders are requested to cooperate and produce the same when asked for. Rider may politely ask and confirm the identity of driver or fellow ride members before boarding in/on the vehicle. Vehicle owner (or driver) and Rider may mutually decide the exact pickup and drop points and both should adhere to that. Vehicle owner (or driver) and Rider will present themselves on time and at the place agreed with the Driver. Vehicle owner (or driver) and Rider will immediately inform each other if they are required to cancel a Trip. Vehicle owner (or driver) should make sure that their vehicle is having sufficient fuel for the ride. Riders should inform the driver if in case it’s not possible to join the ride. Please maintain hygiene and do not share ride if you have any illness. After request confirmation, you might like to call co-riders and Say “Hi”, confirm timing and exact pickup place (considering realistic issue in pickup point). Riders should choose a safe pick up location which will not compromise anyone's safety when you are waiting for the vehicle owner or other riders to arrive. The Vehicle owner (or driver) and Co-Rider agrees to wait at the pickup point for at least 2 minutes after the agreed time for each other to arrive however all are expected to be punctual. Riders will NOT pay the Cost Contribution to the Vehicle owner (or driver). 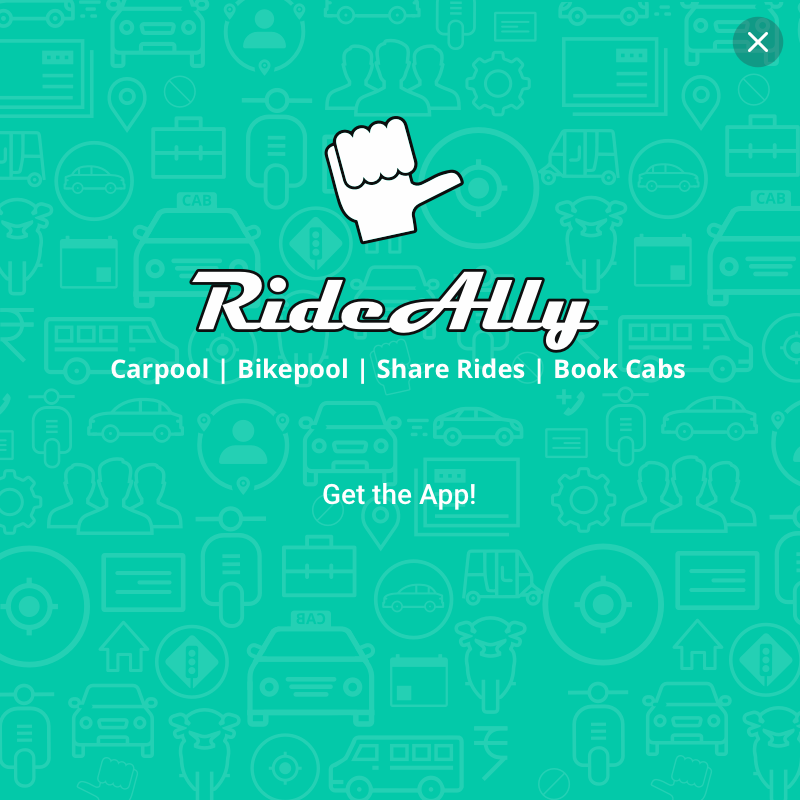 Riders will click on the Check-In button to inform about the pick-up and click on and Stop button after drop-off, to allow the system to calculate shared ride distance (in kms), carbon foot-prints and transfer appropriate reward points to Rider. If the Co-Rider, Driver or Vehicle Owner fail to comply with any of these terms or any other Conditions, Company reserves the right to keep information relating to the breach, to publish or disclose this information on the Members online profile and to suspend or withdraw the Members access to the Site. 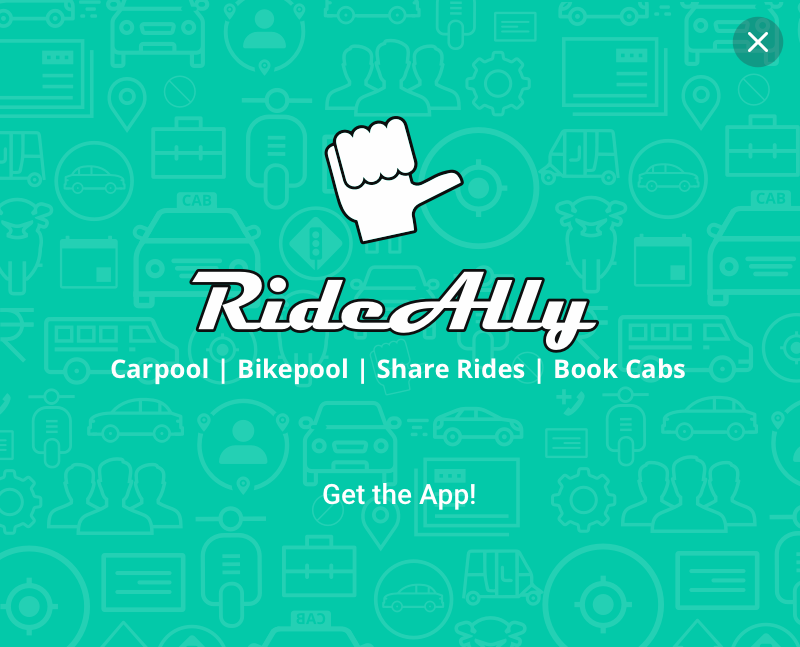 If you need to use RideAlly to check or update some information than we recommend you to do that before you start driving or to park your car in safe designated parking areas if you have to use the platform or coordinate with your ride partner on the way. The Vehicle Owners, Drivers and Riders shall not have Trip for any fraudulent, unlawful or criminal activity. Riders should not ask the vehicle owner or driver (whoever riding the vehicle) to break any Traffic/RTO/City Police and/or government rules for any purpose (especially reaching the destination earlier). The driver has the right to refuse such a request by the customer. The driver also has the right to refuse such a pick-up or ask such customer(s) to alight from the cab if customer forces for it. Riders should not misuse, soil or damage any of the devices (technical/non-technical) in the vehicle. Riders should be sensible for other's time and should not delay the ride start time by reaching late at pickup point. Riders are advised to not to engage in loud conversation which makes fellow ride members uncomfortable. Riders must not smoke and chew tobacco immediate before and during the journey. Riders should not impose his/her choice of music on driver or fellow ride members. Riders or drivers should not park the vehicle in between the ride for a break without consent of all the fellow passengers. Users should cross verify the cost for their ride and then only proceed for booking or joining any taxi ride. Users are requested to mention the pickup and drop points while booking new taxi or joining to any existing taxi ride if exact place not found while booking taxi. Users should adhere to the timings for their pickup as mentioned in the ride. Users are requested to cooperate and produce the identity before boarding the taxi when drivers asked for the same. Users may agree to travel early and some extra distance to pickup other passengers when travelling in shared taxi. Users should inform the customer care (080 4600 4600) if in case it’s not possible to join the ride because of some emergency or any other reason. Users should not ask the driver to break any Traffic/RTO/City Police and/or government rules for any purpose (especially reaching the destination earlier). The driver has the right to refuse such a request by the customer. The driver also has the right to refuse such a pick-up or ask such customer(s) to alight from the taxi if customer forces for it. Users should not misuse, soiling or damage the seats and/or any of the devices (technical/non-technical) in the taxi. Users should be sensible for other’s time when booked or joined shared taxi and should not delay the ride start time by reaching late at pickup point. Users are advised to not to engage in loud conversation which makes fellow ride members uncomfortable. Users must not smoke and chew tobacco immediate before and during the journey. Users should not pressurize the driver to overload the boot space of the taxi with luggage. The customer shall not be allowed to use the seating area of the taxi for placing any kind of luggage. Users should not force the driver to park the vehicle in between the ride for a break without consent of all the fellow passengers.